Controversial Northern province chief minister Canagasabapathy Visuvalingam Wigneswaran who has lost the confidence of at least 22 out of 38 Northern provincial councillors is in a fighting mood and is planning to defy the Tamil National Alliance(TNA) and Ilankai Thamil Arasuk Katchi (ITAK)leadership said informed Jaffna sources yesterday. TNA leader Rajavarothayam Sampanthan and ITAK president Somasundaram Senathirajah have both requested Wigneswaran to resolve the current political crisis in the Northern provincial council by letting Transport minister Dr. P.Sathiyalingam and Transport minister B.Deneeswaran to continue as provincial ministers and if necessary to take action only against Agriculture minister P. Aingaranesan and Education minister T. Gurukularajah. A three member commission of inquiry was appointed by Wigneswaran to probe the corruption and abuse of power charges against the four provincial ministers and issue an “advisory” report for him to take action against thouse found”guilty”if necessary. The inquiry commission comprising two retired high court judges and a former Government Agent issued a report finding Aingaranesan and Gurukularajah of being “guilty” in some of the charges and Sathiyalingam and Deneeswaran “not Guilty” of any charge levelled. Chief minister Wigneswaran however asked Aingaranesan and Gurukularajah to resign “Voluntarily” but in a controversial move demanded that the exonerated Sathiyalingam and Deneeswaran should go on compulsory leave. Wigneswaran said that he will take over all the powers and functions of the four ministers in addition to the portfolios already under him. The controversial chief minister also announced that he would conduct a fresh inquiry against the two ministers already exonerated by the inquiry board appointed by Wigneswaran himself. ITAK president and Jaffna district MP Senathirajah as well as TNA leader and Trincomalee district MP Sampanthan communicated with Wigneswaran and advised him not to equate the ministers found guilty and found not guilty by taking action against them. They said they had no objection to the chief minister penalising the ministers found guilty but objected to principles of natural justice being flouted by punishing those exonerated in an inquiry. Wigneswaran however defied the leaders Sampanthan and Senathirajah by going ahead with his avowed intentions of asking two ministers to resign and demanding two ministers to go on compulsory leave. This resulted in groups of Northern councillors walking out of the council while Wigneswaran was making his announcement. These included both the ruling TNA as well as opposition. 30 of the 38 Northern councillors are elected from the TNA. 8 opposition members are from the UPFA, EPDP, ACMP and SLMC. 16 of the 30 TNA councillors are from the ITAK while the other TNA constituents EPRLF, TELO and PLOTE have 14 . Despite attempts by TNA leader Sampanthan, PLOTE leader Siddharthan and ITAK Parliamentarians Shritharan and Charles Nirmalanathan to help resolve the deadlock a combative Wigneswaran refused to comply. He was supported by LTTE and Pro-LTTE elements in the global Tamil Diaspora and in Sri Lanka. A protest demonstration and procession against the ITAK was held in Jaffna. Funds sent from abroad were used to pay persons 1000 rupees each to participate in the “spontaneous” protest. A Hartal was also conducted. Gangs of youths on motor cycles went about the Jaffna peninsula threatening and forcing shops and businnesses to shut down. Vehicles were kept off the road. Police suspect that the gangs were paid from funds abroad to stage the so called “Spontaneous”Hartal. 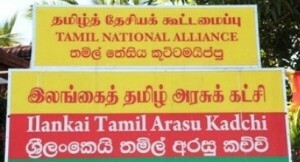 Meanwhile overseas LTTE media organs led by the tiger mouthpiece”Tamilnet” are conducting a vicious propaganda campaign against the ITAK leadership in support of their puppet. In a bid to reduce tensions and resolve the crisis an inter-faith delegation consisting of various religious leaders met with Wigneswaran. When asked how the tensions could be eliminated a tough -talking Wigneswaran declared pompously and pugnaciously “Tell them to withdraw the no confidence motion against me. Otherwise the volatile situation will continue in the North”. The chief minister also had a special meeting with the leaders of the EPRLF, TELO and PLOTE. 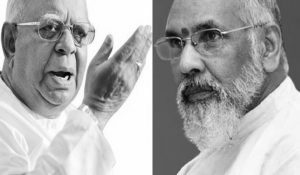 Though Wigneswaran was selected and nominated by Sampanthan, the chief minister was very critical and contemptuous of the TNA Leader and his peace efforts revealed a non -ITAK party leader. Apparently Wigneswaran who is in a combative mode is planning to replace all four ministers appointed by him in 2013. The ministers appointed in 2013 were two from ITAK and One each from EPRLF and TELO. But now Wigneswaran wants to appoint two from the EPRLF and one each from the PLOTE and TELO. The ITAK is out in the cold. According to informed sources the four new ministers whom Wigneswaran is planning to appoint are Kandiah Sarweswaran – EPRLF from Jaffna, Thamotharampillai Linganathan -PLOTE from Vavuniya, Thurairasa Raviharan – EPRLF from Mullaitheevu and Gnanaseelan Gunaseelan -TELO from Mannar. It is said that the “gentlemanlike” Siddharthan of PLOTE is unhappy with Wigneswaran’s confrontational plan but the EPRLF and TELO are quite supportive. Wigneswaran is enjoying the privilege of being chief minister still only because Northern Governor Cooray is delaying taking action on the matter. Once the ITAK General Secretary submits the name of the person selected to replace Wigneswaran the Governor is duty bound to appoint him and ask the new chief minister. It is learnt that ITAK Gen secy and Eastern provincial minister K. Thurairasasingham has already written an official letter nominating NPC chairman CVK Sivagnanam as the new chief minister. Instead of adhering to that leter as is required the governor is delaying matters by trying to asceratain whether Wigneswaran has a majority or not. Cooray is apparently worried about his being blamed if he acts in haste . But by delaying Cooray is only helping Wigneswaran and his acolytes to prolong the agony of the Northern provincial council. It is against this dicey backdrop that Wigneswaran is attempting to appoint four new ministers at a time when the writing is on the wall on the question of remaining as chief minister. But then the retired Supreme court judge with an inflated ego has a reputation for rashly rushing into areas where even angels will fear to tread.